Women's insulated, sweat-wicking gloves for winter. Thick and warm, these women's insulated gloves keep you covered on the coldest days of the year. They have a waterproof insert to keep your hands dry, and the soft lining inside wicks away sweat from your skin. The durable ripstop construction is reinforced with synthetic material on the palm for grip. I'm so disappointed in the fit. 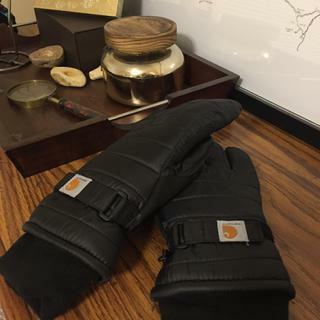 They're warm and look great, but even after measuring my hands according to the Carhartt sizing chart they're way too small and I'm nearly unable to move my fingers around in them. I had to cut the tags off in order to try them on, but see that the Carhartt return policy requires the tags to be left on in order to return and that the customer pays for shipping. Such a waste of money! I have always swore by these gloves to keep my hands warm in the winter while out doing my horse chores. They are very warm- while they last. I have gone through 2 or 3 pair so far this winter. It seems like after a couple weeks of wear they just seem to start to fall apart. The seams come unraveled and they just start peeling apart. This is the first year after many of wearing that I have had any issues with these gloves. Exactly as described. Very warm. Gloves are difficult and awkward to get on as the lining bunches up when you put your fingers in. Also, I have an old pair of knitted gloves with faux fur lining which are just as warm as these gloves. This was not a good investment. I'm returning them. We're sorry these did not meet your expectations. Please contact us at 1 800 833 3118 if you have any questions about the return process. I have scleroderma with Raynaud's disease, These are the best gloves ever for protecting my hands, keeping them warm and dry. This is my second pair. Great comfort when moving snow. Very warm. I have a pair in each vehicle. Arrived just in time for our cold snap (temps in the 20’s). Very pleased. My hands are warm and dry and the gloves seem to be well made. Good value for money. I always buy cheap acrylic/polyester gloves and decided to invest in a nice pair for this winter. These gloves do run somewhat small. I ordered a M and they fit perfectly with a little extra room. I love the look and inside is sooo soft. They come with a clip to keep them together and so far have been very warm especially on mornings that I have to de-ice or hold a cold steering wheel. My daughter had these gloves on her wish list for her birthday. She’s a runner and said these are the best gloves ever! When they arrived and I looked at them, I’m seriously thinking about getting a pair for myself, as I’m a regular walker at our walking trail. I Wore These All Winter in N.D. These gloves look great and kept my hands warm in severe N.D. weather. I love the purple color, so, of course I got the thermal top and pants in purple. These are good gloves! I bought these gloves in December and one month later, they were torn. Yes, I put them through quite a bit of work, but I had only worn the gloves 3-4 times during that month and I was amazed at how quickly they tore. Disappointed, especially because I really liked them before they tore. Awesome & warm! Great addition to my winter accessories! Another great product from Carhartt! Just received mine today so I haven't gotten the chance to wear them yet. I purchased the black in medium and was a little worried about if they would fit or not due to the mixed reviews. The medium fit my hands just fine. I consider my hands to be small and my fingers slender and the gloves left me with a tad bit of extra room in the fingers. The only thing different from the gloves than what is in the picture is mine did not have buttons but a Velcro strap instead. I would buy again. Very warm gloves. I have small hands and even these gloves came a. It too small around the palm but I like the fit around my fingers. Will provide a lot of warmth. May cause hands to sweat if you are exherting yourself outside. So thick and warm! you lose your hands in these! have good grip. looking forward to test these out this winter, especially the waterproof. It is a bit too tight but nice and warm. I would recommend. Bought it late in the cold season so really haven't had a chance to put the gloves to the test. These gloves are very comfortable and warm. I wore them all last year in the very cold weather of Indiana. Snow ball fights with my daughter were great. My hands didn't get cold. They keep your fingers nice and snug. BEST ANSWER: Night shade is a deep purple. I’m confused on what size to order since some say they run TTS and others say they run small. I’m usually a true size small. Help! which size should I order? BEST ANSWER: I’m a true to size small also. The size chart indicated I wore a large - ha, ha. So I ordered a large. When I received them I was sooooo sorry I went by the size chart. I found the same Carhartt gloves at a dealer and tried on the small - BINGO! I bought the small and gave the large away. My daughter is a runner and living in Ohio she runs outdoors in some very cold temps. These gloves are her favorite and they keep her hands very warm. She said “yes” they run true to size, just perfect! Hope that was helpful. Enjoy them! This item is TTS. What may make it feel too tight is the adjustable Velcro strap. I would recommend opening the strap to get an initial fit then they should slip on and off easily without having to make adjustments. I am a woman with skinny hands but long fingers. I ordered a small & the gloves are just a little roomy. Hope that helps. They are nice and warm. I have a small hand and bought a medium which is a bit too big. If I had wanted a more snug fit I should have bought a small. I would suggest a small. I usually wear a small and the small size fit me well. I ordered a small and they fit great! BEST ANSWER: Spot Wash by hand in luke warm water with mild detergent. Hang to dry. Do not use hot water. Do not put in dryer. BEST ANSWER: No, they are not touch-sensitive. Would these gloves work out in the barn stacking hay and such? I don't think so - they would probably tear. more of a ski type glove. yes, they would work good for handling bales. Are these actually waterproof? I work in landscape and will be shoveling snow all winter. BEST ANSWER: Hi have not used them in wet situations, but, if they are listed as waterproof, I would assume they are. Cathartic products are very high quality. I use them for shoveling, snowblowing! Does it actually keep water out? BEST ANSWER: I have used them in wet situations and they have been waterproof. But my gloves developed a tear in them after 3-4 days of use in those situations. They are no longer 100% waterproof but I still make do. I wore the gloves at work in -10 environment, and I didn't get them wet. I personally loved the gloves, so far they are the only ones that can keep my hands warm for up to 2 hrs at a time. They are indeed water proof, and remain quite durable. I got these for my hard working mother two years ago and she still loves them. Yes,outter shell keeps the snow and rain from soaking into the glove. Yes they keep the water out and are very warm. Are these gloves warm enough for -20 F weather? Looking for warm gloves to sit a t a football game in NY in December. BEST ANSWER: Yes! I used them through this past Winter in Detroit. I shoveled snow and got caught in a couple of snow storms and they were great! They are water repellant which helps so much with the snow! You'll enjoy these gloves!! No. These gloves are good for Temps. ( 10 - 32 degrees in my opinion). Carhartt makes heavier insulated gloves that are rated for lower Temps. I own heavier insulated gloves for colder Temps. I use these particular gloves for walking our dogs on long walks. You can use silk or wool liners with them, or put hand warmers in your pockets in colder weather with these gloves. In minus 0 temps. i would use heavier insulated glove. Hope this helps. The gloves are very warm. Wore them to a winter carnival in Saranac Lake last winter with -30 degree wind chill and stayed toasty warm. Good question. The coldest we get here is about 30 F and they are comfortable but I cannot give a firm answer. Sorry. But good luck! I have found these gloves to be more than sufficient for New England winters. They definitely kept me warm and I am always cold. These gloves are very warm. They would be perfect for the game.